Spring cleaning is the heaviest cleaning sessions the whole year round. And most of the cleaning tasks during this season are intensive. Correspondingly, all these tasks are not just a few but many. So, for most cleaners, to get through all these intensive tasks, utilising spring cleaning tips and ideas is very essential. Yes, this is absolutely right. With the help of these tips, your spring cleaning will no longer be difficult and strenuous. You need the right tips that most spring cleaner experts use to make cleaning easier and faster. These tips from experts provide ideas and insights that are effective for the majority of spring cleaners. They emphasise how cleaning should be organised and systematic to obtain effective and efficient results. Concrete examples of these are cleaning that starts from ceilings to floors which is the easiest way of doing deep cleaning and delegating spring cleaning tasks. 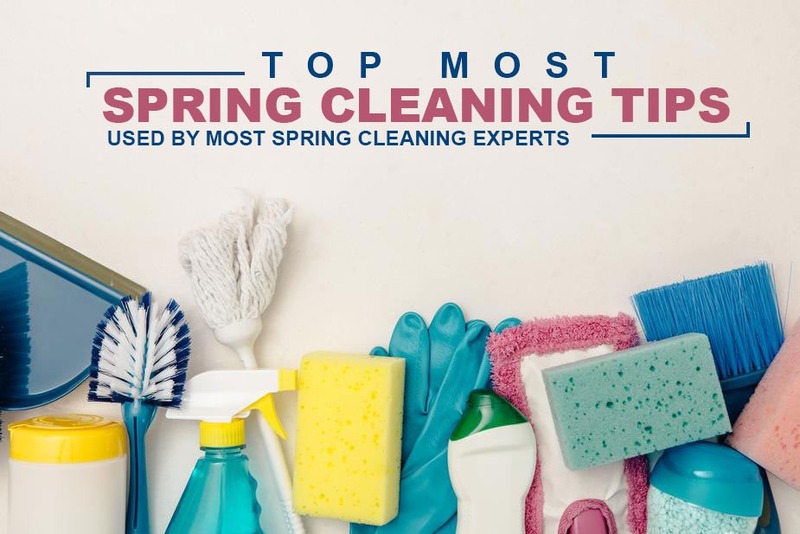 All that said, everything will be made clear to you as you go along with the specifics of our topmost spring cleaning tips. Cleaning is more efficient if all tools are ready and just within your reach. Spring cleaning tips suggest that you need to prepare all the tools before starting any spring cleaning tasks. First, check the supplies if you have them all in your stock room. Then, see to it that you have all the essentials you needed such as your gloves, sponges, brushes, cloths, all-purpose cleaners, furniture and glass polisher, etc. Finally, try to create a small storage container or caddy for all your supplies and tools. This makes cleaning easier and efficient for you. Having all the tools that you need just within your reach will make cleaning easier for you in a number of ways. First, you will not have a hard time going back and forth someplace just to get something. Second, since you saved yourself time by making ready everything that you need, you will have ample time focusing on your cleaning. This way, your work will be organised and efficient. After having all your tools ready, try decluttering and organising your mess over the winter months. You must have clutters of books, toys, ornaments, broken items, clothes, etc. Then, you can pick them up, arrange, organise and simplify. As you simplify, you can choose to donate, sell, keep those you still need or get rid of things that you no longer need. The most efficient and practical way of cleaning is doing it from top to bottom. For when it’s the other way around, this really makes your cleaning unproductive and exhausting. To do this, you need to finish dusting your ceiling first. Then, as you go along with tidying, do light fixtures, clean corners and chandeliers, etc. After that, you can move on dusting furniture, appliances and picture frames. And finally, do the vacuum in all floor areas, rugs and carpets ending it with mopping your floors. First, you can choose to machine wash your curtain. And, be sure to maintain its colour or texture. You can do this by checking the label of your curtains. And by separating the delicate soft cotton fabric from the heavy made materials. If your washing machine has a delicate cycle, use this cycle and choose the cool wash instead of warm setting it in a slow spin. Second, for dry cleaning, you need to follow carefully the instructions on how to vacuum your curtain with utmost care. Usually, experts use a vacuum that has a small nozzle with a short built-in brush. This is the ideal vacuum for your curtains and blinds. And, it would be best, if you vacuum from side to side to thoroughly remove the dust. Finally, for steam cleaning, always be sure to know your curtains type of fabric. With this, you can determine the right level of heat to apply. Keep in mind, that thinner and more feeble fabric cannot handle higher heat levels. So, it’s always necessary for you to know how to handle the steamer you’re using and the different types of curtain fabrics. This way, you can maintain the colour, texture and quality of your curtains. The cold winter must have left your windows looking cloudy. Hence, let that windows shine again this springtime. Deep clean your windows using spring cleaning tips that can give you a shiny finish. The technique is very simple. All you need to do is, remove all your window screens and brush it with a non-abrasive brush. Let it dry by placing it upright the walls of your house. For your window glasses, use a cleaning solution for a clearer and brighter outcome. Likewise, you can also use just plain warm water and vinegar. This solution, however simple, gives the same impressive result and is environment-friendly. Clean your fridge and freezers including the interiors. After months of cold winter, some frozen stocks and food items in your fridge can go mouldy and sour. Subsequently, this can contaminate other foods and is dangerous to your health. Therefore, it is very important that you keep your fridge and freezers thoroughly clean. To do the thorough cleaning, first, defrost your fridge. Then, take all the stocks out and dispose of spoiled goods or items. After that, start a thorough cleaning by using a damp cloth and disinfectant. Spray the disinfectant to the damp cloth, and gently rub to all the outer and interior areas of your fridge. If necessary, include the food cupboards and the trays. Meanwhile, allow it to dry by keeping the doors open for at least a couple of hours. As soon as it’s completely dry. it’s finally time to turn on your fridge. Your oven needs a deep cleaning to remove piled up residues for months. These residues can block oven filters and cause your oven temperature to go inconsistent. When this happens, your oven can be damaged and may no longer work for you. Hence, deep cleaning your oven and its interior is highly recommended. Spring cleaning tips provide you with the ways to do this as spring cleaner experts do. To begin with, remove all the oven racks and soak it in a mixture of hot water and oven cleaning solution or dishwashing liquid. Let it stay overnight, brush up with a non-abrasive brush in the morning, rinse with water and let it dry. Next, clean your oven interiors. Apply a soda paste to all the interior parts of your oven except the heating elements. Let it stay overnight, allowing the stains and smudge to soften. In the morning, scrub off gently all the stains using a damp cloth. Finally, clean your oven’s top corners and glass doors. For oven top corners, remove the burner grates first. Soak in a mixture of warm water and baking soda or any oven cleaning solution for 20 minutes. Remove from the mixture and rinse with water. Meanwhile, clean your oven top corners using a dish brush. Remove all the grease using a damp cloth, and return the burner grates back to its place. For oven glass doors, use a sponge to clean both the inside and outside. The process is, damp the sponge in a water and baking soda mixture and rub it gently to the oven glass doors. And, as soon as cleaning is completed, buff a paper towel, allowing it to dry. Replace your beddings, disinfect your mattress and leave it all fresh and new. To do this, you need to use a vacuum cleaner. This is to remove the dust and hair that has accumulated all throughout the winter months. If, in case you’ve spotted stains in your mattress, remove it using a stain remover or a baking soda. How to do this, is very simple. Just sprinkle a small amount of baking soda over your mattress. Let it sit for 2 hours, and remove the stain using a damp cloth. Your mattress will always be fresh and clean if you try to follow this simple cleaning tips. And, thorough clean your mattress at least once every three months. Rugs can hold unpleasant odours and bulk of dust and dirt if not cleaned regularly. Unpleasant odours and dust, if spread all throughout can really take out the good atmosphere of your house. And the bulk of dust and dirt can cause respiratory problems, especially with those who have asthma history among the members of your family. Taking out the dust and dirt, hang your rugs out on a washing line and beat with your sweeping brush handle. Do this several times, until all embedded dust is removed completely. Once done, vacuum your rugs to remove the fine dust and apply a carpet shampoo to finish and to restore its cleanliness and freshness. If some tasks are too difficult for you to complete, might as well hire professional and expert spring cleaners. Spring cleaning usually involves multiple and laborious tasks. For you to do these tasks, it is necessary to set aside adequate and sufficient time. And, doing multiple tasks altogether at the same time can possibly make you feel exhausted and bone-tired. Especially, for tasks like deep cleaning of ceilings, windows, oven, mattresses and carpets. And probably, an entire day to complete all these tasks is certainly not enough at all. Therefore, it is highly recommended, that you delegate some tasks instead of doing it all by yourself. This is for you to save your time and energy. Or, better yet, might as well consider hiring expert spring cleaners. They are mostly experts and professionally trained to deliver quality services for your advantage and satisfaction. Spring cleaning is a thorough house cleaning that’s typically done every after-winter season or springtime. Consequently, deep cleaning of ceilings, windows, oven, mattresses and carpets are some of the usual tasks that most cleaners do during this season. And generally, most of these tasks are heavy-duty that requires sufficient time and effort. So, in completing these tasks, it would be most beneficial to utilise spring cleaning tips. These tips give helpful insights on how to make all spring-cleaning task easier and more efficient. Need more helpful tips for spring cleaning? Our website contains blogs and different services that cater to all your cleaning needs. You can also click on and set an appointment anytime. Visit our website today. This entry was posted in Spring Cleaning and tagged Apartment Cleaning, Carpet Steam Cleaning Perth, cleaning tips, Deep Cleaning, Home Cleaning, Maid in Perth, quality cleaning services, quality house cleaning services.